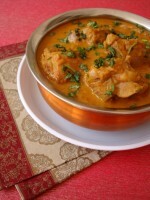 Chicken marinated in ginger/garlic and then cooked in a creamy sauce kind of gravy. Chicken pieces cooked with almonds, seasame seeds etc along with ginger/garlic paste. Velvety white sauce made with milk and flour with chunks of chicken and sweet corn. A spicy chicken dish in which Chicken is stir fried with whole spices along with lots of tomatoes to get a tangy touch and aroma. A filling Thai dish in which Strips of chicken (or beef) are marinated in a special Thai paste and serve over noodles along with Satay sauce. 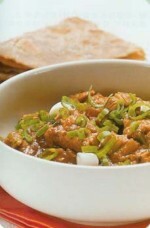 Bihari Boti is a marianted boneless meat which is spicy yet so tender and usually grilled. But find in this recipe how you get the same authentic taste of this savory dish without using a grill. This chicken fried rice recipe is very easy to make and tastes delicious too.It goes along well with almost everyhting. The most simple step by step recipe of Chicken tikka with no extra oil added. Chicken in curd is an interesting chicken curry recipe with the chicken pieces cooked in a spicy and delicious curd based gravy. Chicken marinated in hearty herbs and spices and then baked. Chicken in a batter of salt, pepper, flour and paprika, quickly fried in hot vegetable oil. Jambalaya is basically a dish made with chicken, beef/mutton(boneless), rice, tomatoes, celery, and spices. Chicken marinated and then cooked in tasty mango and ginger garlic paste.